The multifaceted issue of the US Theater High Altitude Area Defense (THAAD) anti-ballistic missile system deployment in South Korea could be resolved only with the participation of the United States and China, analysts told Sputnik. WASHINGTON (Sputnik) — South Korean President-elect Moon Jae-in will probably be unable to prevent the deployment of the US THAAD system in his country despite his expressed opposition to it. "There is very little he [Moon] can do about THAAD now," University of Illinois International Law Professor Francis Boyle said on Friday. "[US President Donald] Trump rammed it in there before Moon’s election precisely to preempt Moon from taking any steps to stop THAAD. Moon, who advocates peacefully reducing tensions between North and South Korea and who has expressed skepticism about deploying THAAD, was elected president by a wide margin on Tuesday. Boyle said Moon would have no choice but to accept US military diktats because of Washington’s massive armed presence in his country. "In all honesty, with 28,000 US troops there, South Korea is basically under the de facto military occupation by the United States left over from the Korean War," he said. The deployment of THAAD in South Korea was really a US strategic move against China and Beijing’s efforts would be required to convince Trump to remove it, Boyle recalled. "The United States put THAAD in there as part of their ‘pivot against China’ that was started by [previous US president Barack] Obama. It will really be up to Chinese President Xi [Jinping] to convince Trump to pull out THAAD — if that can be done," he said. Boyle suggested that pulling the THAAD system out of South Korea could be accomplished as part of an overall deal among between the United States, China and North Korea for the denuclearization of the North. "I am confident President Moon will do what he can to promote such a deal," he said. Woodrow Wilson Center senior Asia affairs fellow Shihoko Goto agreed that the THAAD issue looked likely to remain divisive between Trump and Moon. "There is no doubt that THAAD has caused a rift within [South] Korea and hampered Seoul’s relations with Beijing, and the odds of [South] Korea and the US not seeing eye to eye remain high," she remarked. Another potential rift for South Korea was its relations with Japan, Goto added. "The two sides remaining in conflict over history," she said. Trump and Moon appeared to have launched their relationship on a good start with their phone conversation on Thursday, Goto observed. "The phone call between Presidents Moon and Trump… was successful insofar as it did not rock any boats. Both sides acknowledged the importance of the other, and both vowed to work closely together in the future," she said. However, concerns remained about US-South Korean relations on the security and economic fronts, Goto cautioned. "On security: There are still many unknowns about how Moon’s more conciliatory tone with North Korea will pan out," she said. 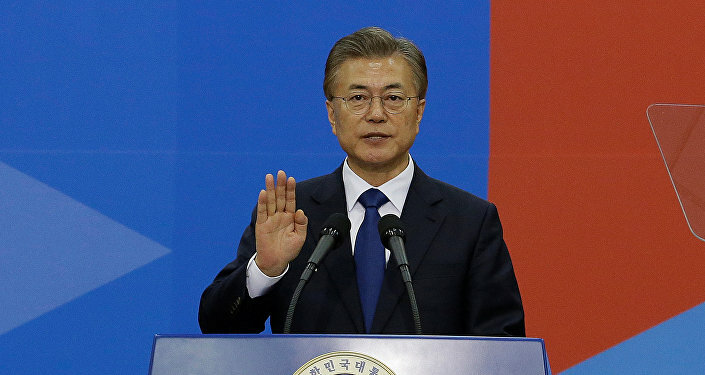 Moon also faced the challenge of reinvigorating the South Korean economy and restoring public confidence after the impeachment of his predecessor President Park Geun-hye.